It's almost the end of Feb, so obviously I'm dreaming of sunshine and warmer temperatures. BUT I live in Belgium, so my blue-sky hopes are usually dashed on the daily. A girl can dream though, right? I mean, I am a Pisces. 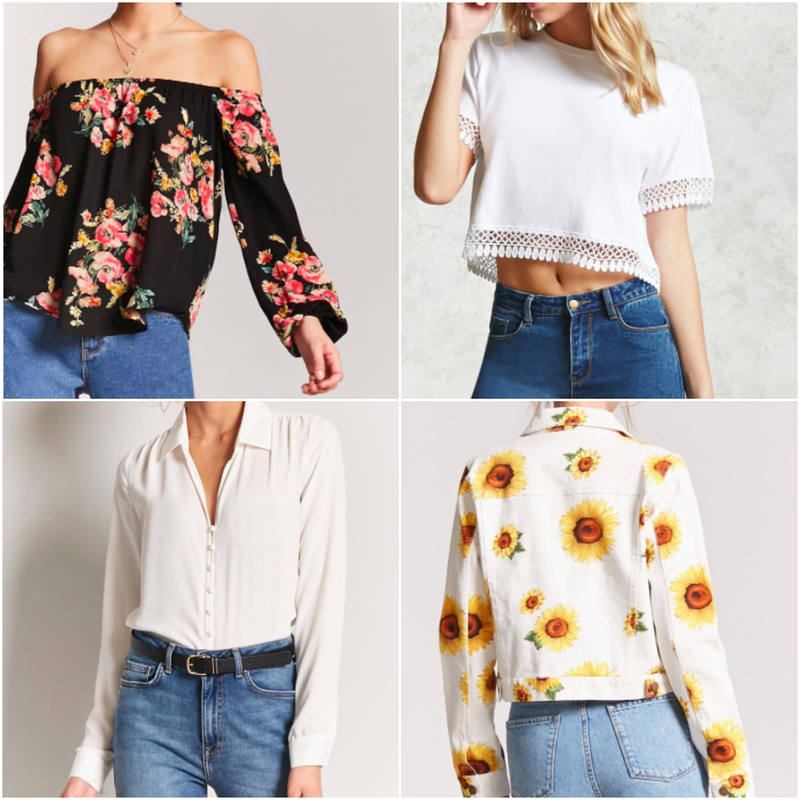 That being said, since birthday month is almost upon us, I decided to do a little order from one of my first full-blown shopping loves: Forever 21. I tend to try and stick to the Contemporary line or basics, and I could easily insert the standard Devil Wears Prada reference about the theme of my more unique picks, buuuuuuut I won't, cause now you're thinking about it anyway. I'm extremely happy with the purchases I made. I'll be happier when I can wear them (and when my current sinus infection clears up), but a girl in Ghent can't be too picky. I actually did wear the boxy blouse last weekend when I was out to lunch with PJ - a mistake, because we had chicken satay and I had to wear my coat over it to ensure that no sauce splattered, but I was really impressed with this shirt for the price. It's slightly sheer, so I wore it with a cute black lace bralette underneath, with the front tucked into some black skinnies, and some low-hanging gold jewels to draw the eye down towards the buttons. The BUTTONS! I love them. The main reason for my venture back into buying from Forever was that denim jacket. I am seriously obsessed with it and the moment I put that on my body, Spring will have officially begun. Granted, in this country that could be in June but I'll take a vacation to somewhere warmer if I need to. I'm that desperate to wear it. Maybe my birthday will suddenly grant me a spectacular day and I'll be able to throw it on at least once in the next few weeks. Have you gotten anything for the new season yet? What are you loving?